To change the lives of children and families by improving their mental, physical, & emotional intelligence through Martial Arts Cross Training. We specialize in Youth Development, Sport Karate, and Self Protection for men, women and children. A unique mix of Sport Karate, Tae Kwon Do, Traditional Karate, Aiki Jiu Jitsu, Close Quarter Combat, Yoga, and Kick Boxing. We combined over 40 years of extensive knowledge and training of these arts to create an more effective Martial Arts Cross Training style. For decades, our unique blend of training has changed the lives of hundreds of students—mentally, physically and emotionally. It has also helped athletes of all ages improve their performace on and off the field. 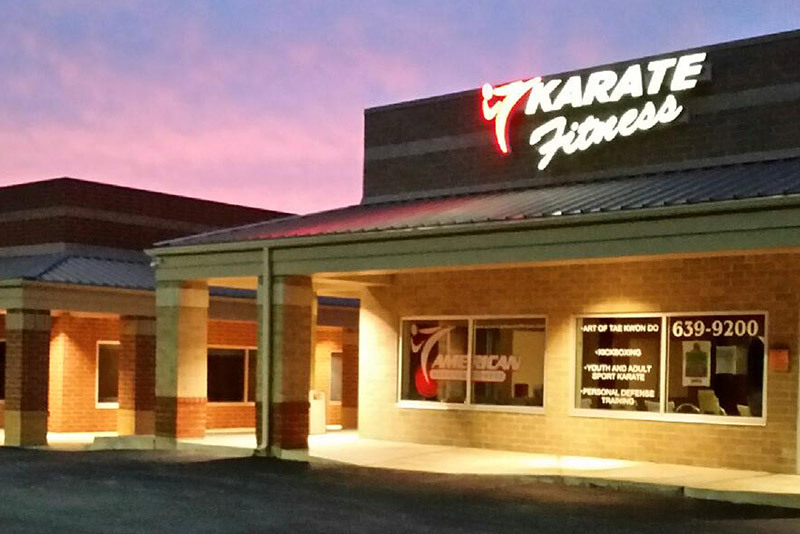 Founded in 1974, American Karate has a long history of producing excellent students, instructors and competitors. American Karate's legacy began in Florissant, Missouri where the foundation was laid for a true family focused Martial Arts school. In 1996, after nearly 15+ years of training with a variety of experts and teaching students of all ages, Rich Norton and Steve Sutton purchased the business. They expanded the Martial Arts system to include Kickboxing, Preschool Karate and Sport Competition Team. In 2001, they launched The Classic Karate Championship, an open style karate tournament. The Classic has become one of the largest and most popular karate tournaments in the Midwest. In 2005, they moved the business to Wentzville where it currently thrives at 1456 W. Meyer Rd. Recently, Mr. Norton and Mr. Sutton launched another karate tournament championship specifically for kids called The Junior Classic. With 40+ years in the Martial Arts Business, American Karate genuinely understand the commitment, dedication and responsibility of being a positive influence on each and every student and the community! We take pride in providing a clean, friendly, and well equipped training facility for students of all ages and abilities. We believe in Martial Arts cross training, acknowledging that no single art is superior in itself and that a well rounded Martial Artist is one who remains humble and welcomes all styles. Mr. Norton is co-owner and head instructor at American Karate as well as promoter of the AK Classic Karate Championship. Rich began studying Martial Arts in 1978 with Jung Sim Do Martial Arts under Master Robert Ley. For the next two decades Rich honed his skills as student, teacher and competitor, studying and excelling in a variety of styles such as: Tae Kwon Do, Hap Ki Do, Judo, Aikido, Brazilian Jiu Jit Su and Kick Boxing. He combined his knowledge of the variety of styles to create an all encompassing Martial Arts cross training style with a Tae Kwon Do basis. In 1996, Rich received Ni Dan (2nd Degree Black Belt) while entering the National Karate Competition Circuit — finishing in the top two in the U.S. in 1997 and 1998. Mr. Norton is presently ranked 6th degree (Rokudan) and was recently inducted into the Karate Hall of Fame for 30 years of excellence in teaching martial arts. He has helped make American Karate one of the most recognized schools in the region and one of the most awarded teams in tournament competition. Mr. Sutton began studying and training in the Martial Arts under Sensei Kent Angeli in 1974, the founder of American Karate. Over the years he attended seminars and performed in outside training in Judo, Jiu-Jitsu and Kick Boxing. After many years of training he received his Black Belt (1st Dan) in Tae Kwon Do under Sensei Mike Byington, which he then became a school instructor. He then began competing in local and national tournaments and over the years as a Black Belt became ranked in two competition organizations (Midwest Martial Arts) and (United Karate Alliance) Mr. Sutton purchased American Karate in 1996 along with Rich Norton. He is presently ranked (5th Dan) in Tae Kwon Do and co-promoter of the (AK Classic Karate Championship). Mr. Sutton currently specializes in Weapons, Sport Karate, Self Defense, Group and Private Lessons. He continues to be dedicated to shaping American Karate students physically and mentally. Greg Holmes began his training in 1972 with Bill Laub. Attained 1st Dan Black Belt in 1979. He joined American Karate in early 80's with founder Kent Angeli. Presently, he is ranked 4th Dan in Tae Kwon Do and teaches Jiu-Jitsu, Sport Karate, Group and Private Lessons. He is also a member of 30 Year Black Belt Hall of Fame. Mr. Morell began his Tae Kwon Do training in Puerto Rico, and attained a 2nd degree Black Belt in 1979, under Yun Nam Lee. While studying Kempo and Kung Fu in Florida, he attained a 2nd degree Black belt in Pai Lum White Dragon Kung Fu in 1994, under Bill Gregory, and a 4th degree Black Belt in Kajukenpo Chinese Kempo in 1997, under Gino Cretella. Owned and operated Kajukenpo Martial Arts School throughout the late 80’s and 90’s. Devon has been training Kickboxing and Sport Karate with American Karate since 2009. With a Masters in elementary education and four children of her own, Devon is the perfect choice for teaching our 3-6 year old students. It allows her opportunity to combine a professional teaching background with her love for Martial Arts. Ms. Devon encourages her students using positive reinforcement while capitalizing on their individual strength's — building the basics of respect, motor skills and self-confidence.